Summer albums released in this age of global unease definitely have a different flavor in 2018. 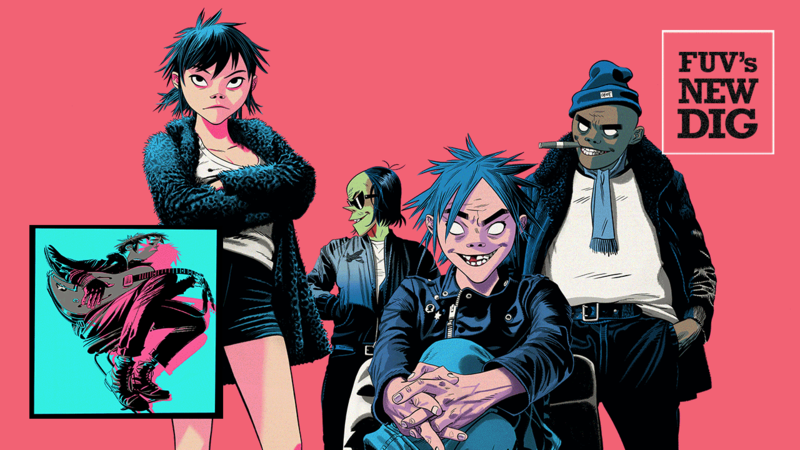 While Gorillaz' captivating sixth album, The Now Now, doesn't find Damon Albarn making direct commentary on the anxiety dogging the world's reaction to a particular sociopolitical situation, there's definitely a strong wind of unrest, personal and otherwise, that rifles through this swift followup to 2017's Humanz; it's a compelling coda to its predecessor. Yet the The Now Now is definitely a reflection of the United States, from the viewpoint of an emotionally torn visitor who'd like to go home. Back in 2010, a mere nine months after the release of Gorillaz' Plastic Beach, a busy, all-star extravaganza that lassoed the likes of Lou Reed, Little Dragon and Snoop Dogg, the band's co-creators, Albarn and illustrator Jamie Hewlett, quietly released their fourth album on Christmas Day, The Fall. Unlike Plastic Beach, The Fall mostly eschewed guest stars and relied heavily on the heavy thoughts sifting 'round Albarn's mind on tour in the States, as he pondered his existence looking out hotel room windows in Phoenix, Dallas or Seattle. Albarn's vocals, always colored with the grey hue of wistfulness, drifted to a pretty vulnerability in this series of iPad-generated ideas, and revealed some lovely tracks, like "Revolving Doors" or the heavily-treated, cinematic "California and the Slipping of the Sun," which idled into Boards of Canada territory. After a long hiatus of seven years (Albarn and Hewlett were estranged for a spell), Gorillaz released Humanz in 2017, another album propelled by Albarn's ambitious dream casting of dozens of famous and not-as-famous collaborators — like Noel Gallagher, Grace Jones, Kali Uchis, and Vince Staples. Since Gorillaz is so popular Stateside — far more than Blur, Albarn's other principle band, ever was — Albarn and his touring bandmates spent a lot of time traveling through North America. After lodging in more sterile hotel suites, the loneliness that apparently descends on Albarn whenever he's criss-crossing the States has led to a rather quick sixth album, The Now Now, another low-key, mostly all-Albarn collection of solitary ruminations. "I don't want this isolation," Albarn pleads repeatedly on the delectably breezy "Humility," a choice collaboration with jazz guitar master George Benson, with a melody that sounds like summer should feel. The juxtaposition of Albarn's aching entreaties, the song's plucky, Calypso-sparked saunter, and Benson's blissed-out groove is a perfect encapsulation of The Now Now's insistent grasp for light while the world plunges into darkness. The unhurried lope of "Kansas" is a candid exercise in self-therapy, fighting off tears to "find another dream," hopefully in the green hills of home. "Idaho," where Albarn has said he recently learned fly fishing, looks beyond the deceptive peacefulness of that lake and out a tour bus window, observing the harsh truth of "silver linings getting lost." In contrast, exhilaration abounds on the juicy, funked-up, mostly instrumental "Lake Zurich," a exuberant sashay of synths with jittery cowbell. The darkly propulsive "Hollywood," with Albarn and Gorillaz vets Snoop Dogg and Jamie Principle trading warnings, serves as a profane, cautionary (but weirdly affectionate) tale of the perils of that starry Los Angeles enclave. The City of Angels fares more tenderly on the gorgeous "Souk Eye," the quiet gem of The Now Now: a delicate, music box lullaby for a missed lover that cleverly ramps up in velocity, transforming into a sensual house tango. On The Now Now, pop bleeds into hip hop and expands into dance, track by track. Working for the first time with producer James Ford of the British electronic duo Simian Mobile Disco (SMD released their own revelatory album, Murmurations, this year too) and longtime cohort Remi Kabaka, Albarn is refreshingly blunt about his own turmoil here. Even though he claims in interviews that he's assuming the guise of his animated alter-ego "2D," there's a sadness that's always shadowed Albarn's public swagger and rock star braggadocio. He's a brilliant musical polyglot and explorer, but it's his disarming vulnerability that's always given his songs an arresting depth — and it's that deeper specificity that Ford and Kabaka demand of him here. The Now Now isn't an album made for instant gratification; in fact, it might take six or eight listens before the impact of what Albarn's done — this intimate mix of mournful wanderlust, devastating lyrics, subtle textures, and shifting tempos — really makes sense. While Albarn's 2014 solo debut album, Everyday Robots, was notable for its rich, autobiographical depth, he's taken an even bolder leap into his own psyche with The Now Now. It's an illuminating road trip album; a cry for camaraderie in these tumultuous times and a reminder of the enduring comfort of loved ones, family, and friends.